How Does Travel Benefit Children? Seeing the bigger picture – One of the great things about traveling with your kids is that it gives them the opportunity to realize that there is more going on outside their “home bubble.” There are other people who work and play just like them, but who may speak a different language, wear traditional clothing, or who believe in different things. Children become not only culturally aware, but may feel greater gratitude for their own background and circumstances. They have the chance to learn more about themselves and can gain a larger perspective on life in general. Ability to solve problems easier – Traveling requires getting places and making decisions like what and where to eat, what entertainment to participate in, and when to shop. Although not life changing decisions, vacations are great opportunities to make group decisions and allow room for learning how to solve real-world problems. With new responsibilities, children can face and conquer various challenges and develop better habits. Quality time with family – This is a huge benefit for children as they all need love and attention, even if they don’t outright say it! Vacation time not only allows opportunities for making and sharing memories, but it also builds family trust. Since no neighborhood or school friends are around (and even if they do tag along), children come to recognize how much they rely on their family members to get around, as well as having their food and other necessities provided. Life then becomes more about achievements than possessions. The bond between family members is strengthened and children learn more about attributes such as sharing. Builds character – Travel can help children have greater confidence and self-esteem as they learn to adapt in new places, gain independence, and recognize their blessings. Being immersed in different cultures expands the world they live in as they realize there is much still to learn about life. As their character builds, judgment gradually becomes replaced by love and understanding. Travel can often be used as a good reward for hard work. Better Health – A child’s immune system can be strengthened when surrounded by varying forms of bacteria. Not only does physical health improve, but mental health as well. That comes from increased self-confidence and purpose. Travel is not a “curer of all diseases,” but it helps boost the body and spirit. 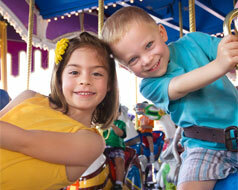 What other ways have you seen your children benefited by travel?